Getting to Glenwood Caverns Adventure Park is part of the fun. At the edge of town, visitors hop on the Iron Mountain Tramway, a scenic trip to the top of the mountain where a rustic amusement park waits. 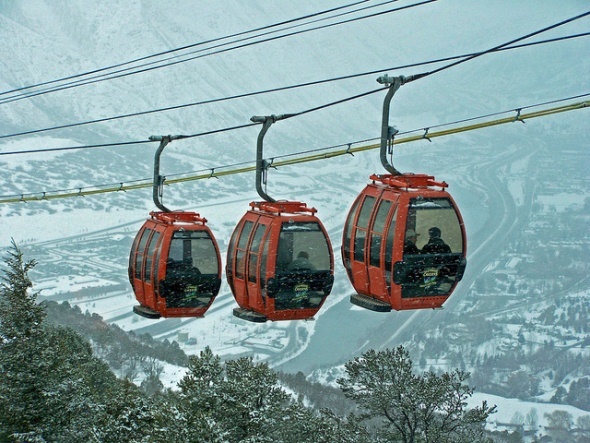 Topside, there is the first alpine slide in the state, a huge swing over Glenwood Canyon (1,300 feet below), a 70-foot bungee jump, a zip ride 625 feet down the mountain. Tamer souls can take on a climbing wall, a 4-D motion theater, an Old West town, a mechanical bull ride, laser tag games and a restaurant with a huge view. Tours of Fairy Caves and King’s Row take visits into caverns and through stalactites, stalagmites and other rock formations.